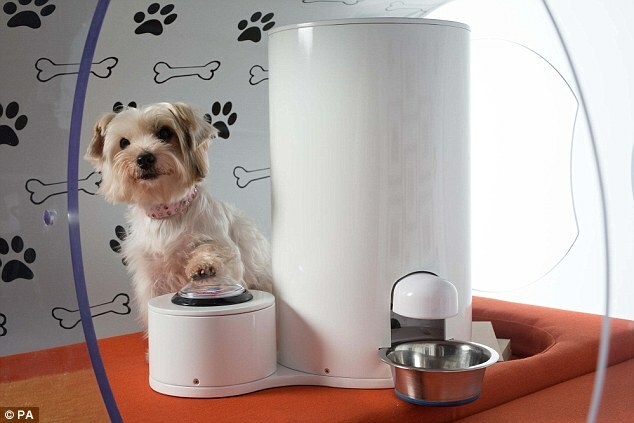 Samsung designs £20,000 kennel featuring paw operated snack dispenser and a hot-tub. 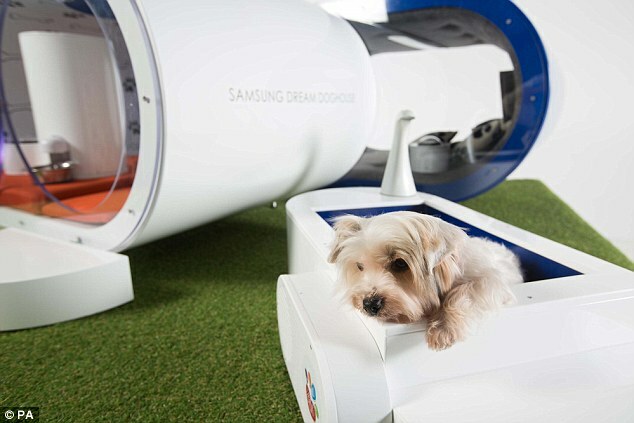 Samsung’s futuristic kennel is created to celebrate Crufts 2015. 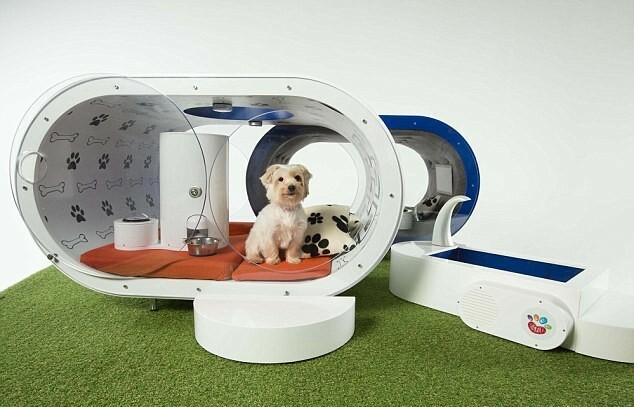 The Dream Doghouse cost £20,000 to make and features two main rooms. Padded bedroom contains a tablet TV and tannoy to summon owners. 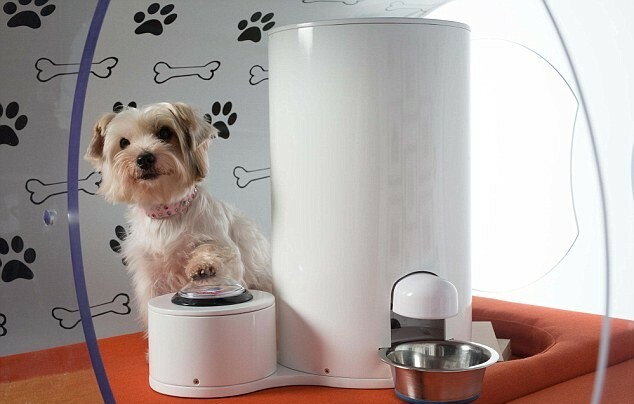 Living room includes a dispenser so dogs can give themselves treats. 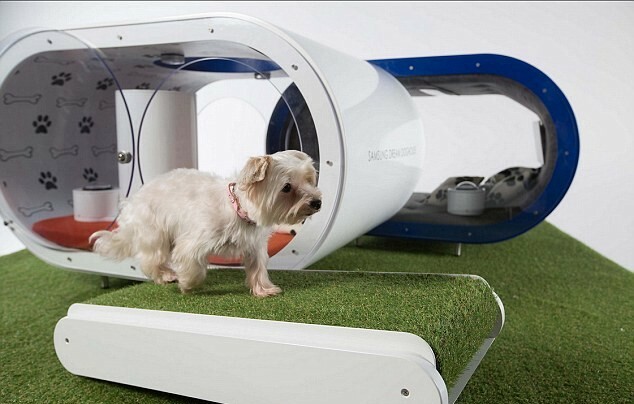 Outside there’s a treadmill and hot-tub for athletic canines . Samsung says 64 per cent of dog owners think their pets would benefit from more technology and gadgets, such as treadmills and tablets. With a kennel this fancy, dogs may deliberately misbehave in order to be in the doghouse. 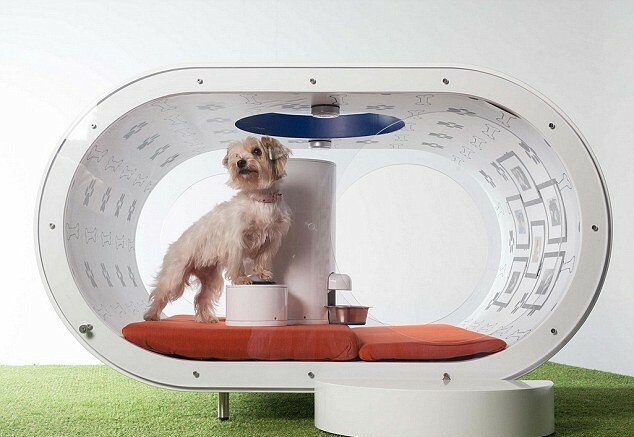 So, has unveiled a futuristic kennel with luxuries including an entertainment wall, paw operated snack dispenser, ‘woofing’ tannoy system and hot-tub. 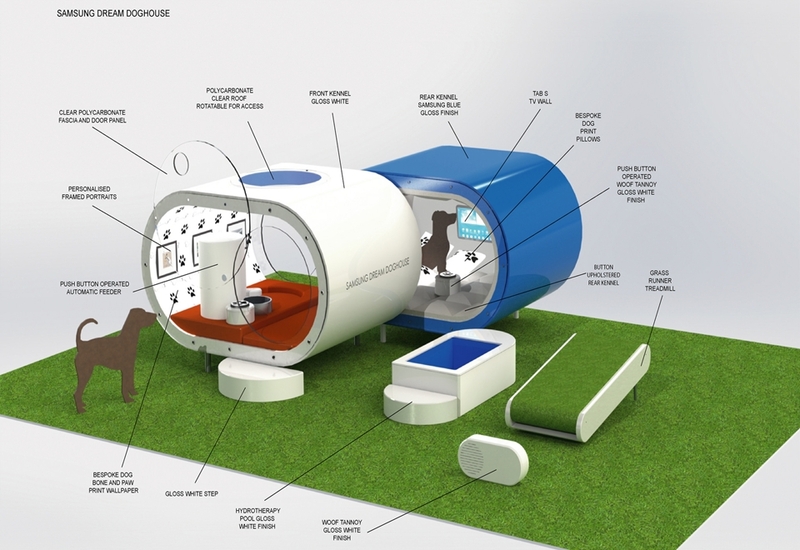 The ‘Dream Doghouse’ was designed by a team of 12 architects and fabricators and took six weeks to make. 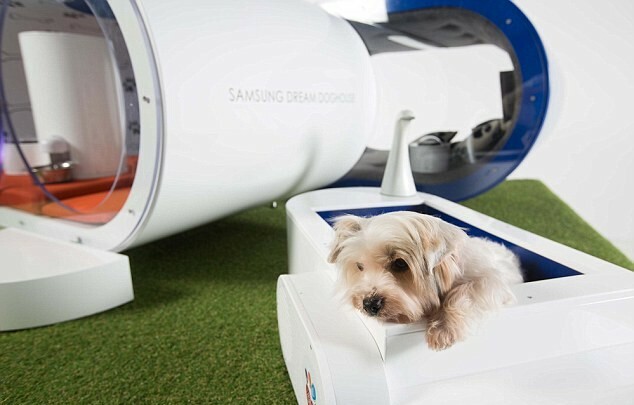 It was commissioned to mark Samsung’s sponsorship of Crufts 2015, which is the world’s largest dog show. 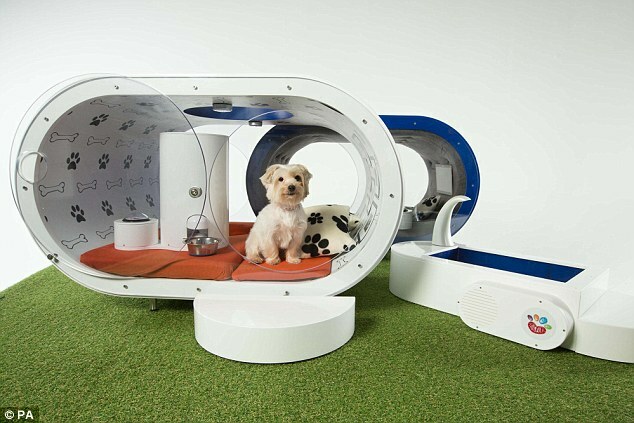 The prototype kennel is divided into two areas – one for rest and relaxation and the other for dining. There is also an outside astro-turfed leisure area for some exercise. 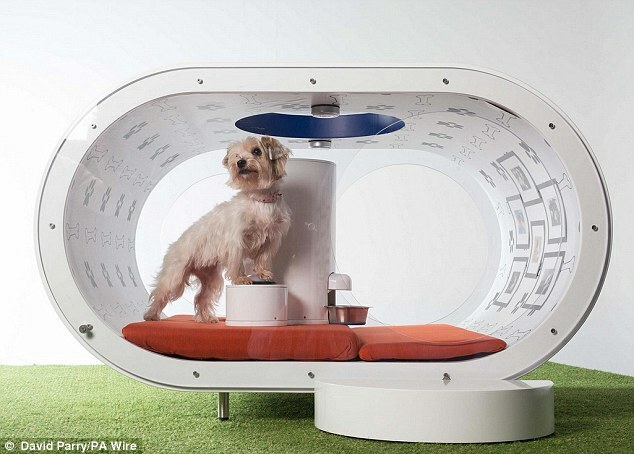 To work out the most desirable features for the kennel, Samsung surveyed 1,500 people. It found 64 per cent of dog owners think their pets would benefit from more technology and gadgets, with a quarter admitting they would like their dog to have treadmill, and a similar number a TV or tablet. Almost one in five said that they would like their dog to have a hot-tub or spa while 22 per cent found the idea of a dog operated feeder the most appealing. The back area of the Dream Doghouse features a padded sleeping area with ‘dog-proof’ leather buttons and luxurious bone pillows. 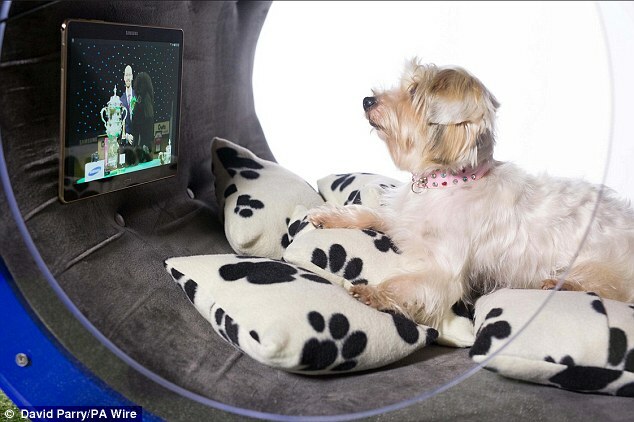 A wall-mounted Samsung Galaxy Tab S allows dogs to watch TV from their bed and owners to contact them via an interactive video link. Dogs can even summon the attention of their owner using a ‘push to woof’ call button. In the front kennel, dogs can stare out at a garden through a large polycarbonate window, or take in the ‘designer’ paw and dog print wallpaper, upon which frame portraits of Crufts winners hang. A skylight doubles up as ceiling access for ‘athletic types’ and a dog operated snack dispenser means pampered pooches can help themselves to treats, instead of begging. Outside, there’s a treadmill to keep canines trim – and work off all the slef-given snacks – as well as a hot-tub for sprucing up after a muddy walk. 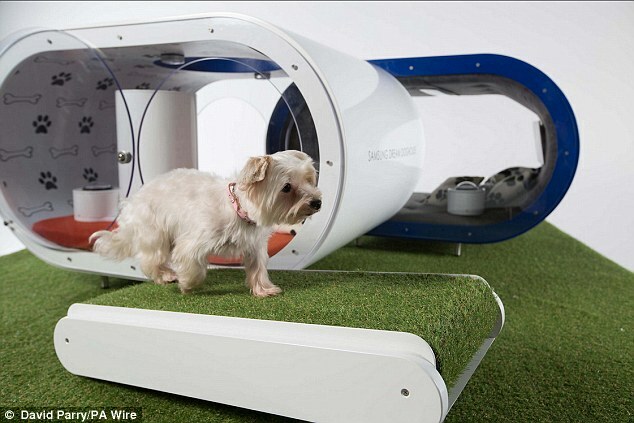 While the hi-tech kennel may just be a bit of fun, pets are becoming more high tech, with trackers and other gadgets becoming more common. A quarter of owners surveyed said they have made a social media profile for their dog and half regularly post pet pictures online. Around four in ten owners have left the TV on while they are out of the house to keep their dog company, while a quarter use the TV to block out scary noises such as fireworks. Some owners even go so far as to video call their dogs when they’re away, with 14 per cent admitting to having done this. 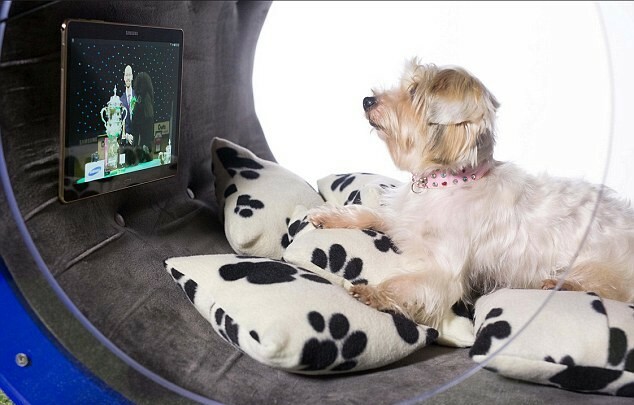 Perhaps people are so keen to splash the cash on doggie gadgets because 85 per cent of Britons consider their pets fully-fledged members of their family, according to the study. Over half say their animal has influenced where they live and what job they do and just over 40 per cent eat at the same time as their dog in the evening.